It’s been 50 years since the U.S. Surgeon General issued a groundbreaking report on the dangers of smoking. The report opened the way for decades of measures to curb tobacco use —measures that helped save an estimated 8 million lives over that time span, according to a study published this week in the Journal of the American Medical Association. About half (53%) of Americans still see cigarette smoking as an extremely or very serious public health problem, according to a Pew Research Center survey conducted last November. 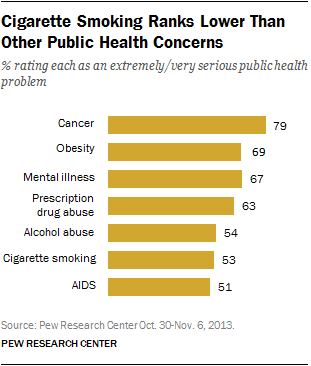 But the public now sees it as less of a problem than a number of other public health issues like cancer and obesity, and less of a problem than it did in 2004 when 72% rated it as serious in an ABC News/Time poll. Asked whether the U.S. is making progress in dealing with cigarette smoking in 2013, 45% said it was, while 39% said things were about the same. Just 13% saw the efforts to deal with smoking as losing ground. By comparison, 35% saw the country losing ground in dealing with mental illness and 34% said the same about the issue of obesity.